I receive alot of questions, about how I create a finished hand painted original. Enjoy. 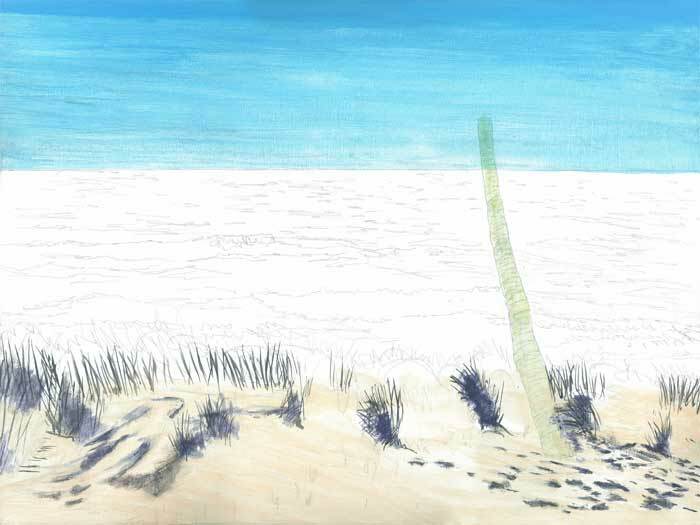 Here is an example of "Coastal Lullaby"
I put several pieces/images from multiable sources together in photoshop. I do this to work out any compositional problems, including lighting issues, before I start any painting. Once this done, I print the source material out on a 5"x7" picture paper and paint from the photograph. 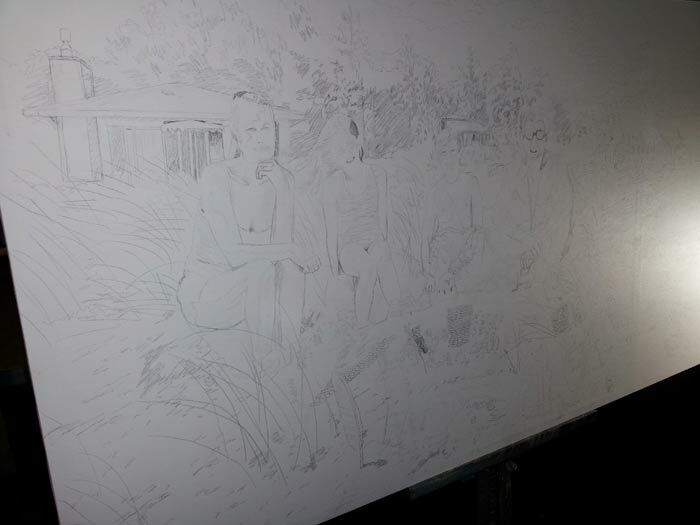 Here is the first step in the painting process, past drawing it out with a "#7H" pencil. This pencil seems to make a harder pencil line and doen't smear as much as a #2. As you can see, I try always to work from back (background) to front(foreground). Moving further, I am slowly developing the water. 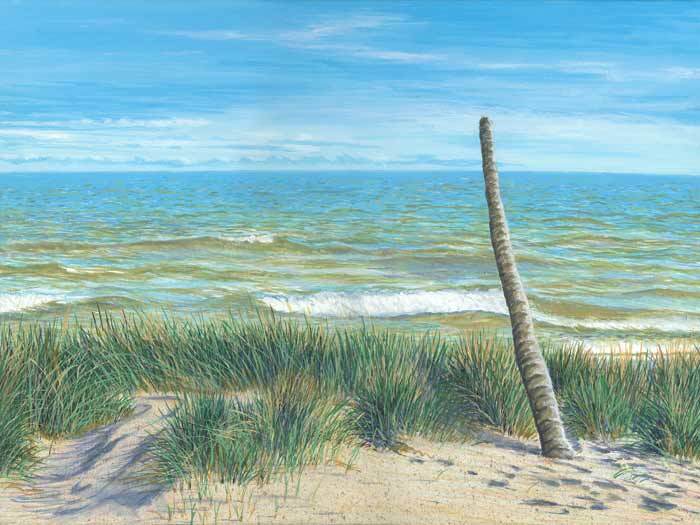 The palm trunk is still masked off. 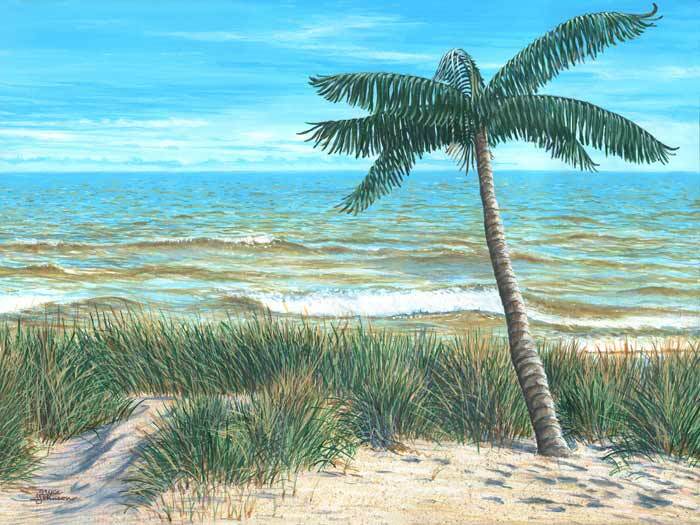 After the sand, waves, and shadows are put in, I can unmask the palm and paint it in. This all leads up, to the palm leaves, to finish the piece. 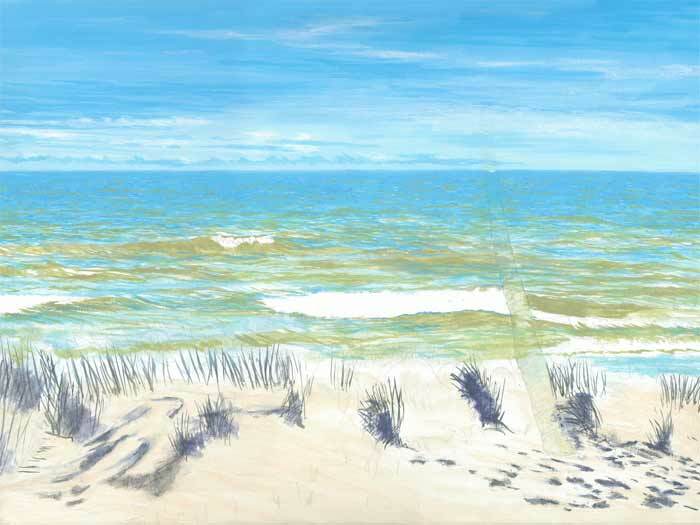 Here is the finished painting: "Coastal Lullaby"
I put several pieces/images from multiable sources together in photoshop. In the case of the example here 39 pieces were worked together to prepare a previse of what the paint would start out like. Once this was done, I print the source material out on a 5"x7" picture paper and paint from the photograph. Again, I try always to work from back (background) to front(foreground). Moving further, I mask off objects that should stay white. Start with the sky. I develope the water area. 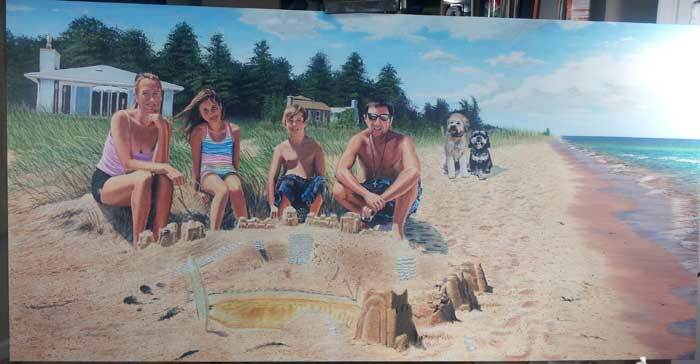 Start the sand and shadow areas. 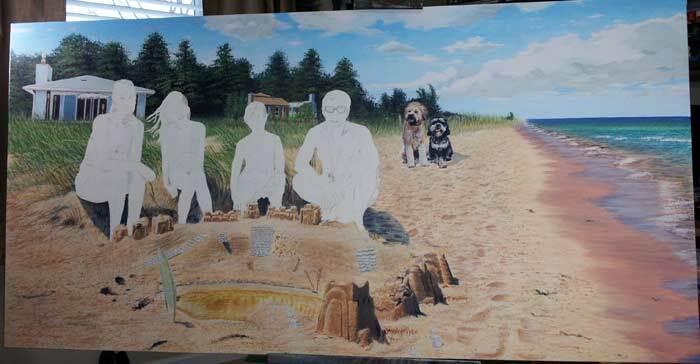 After the shadows, sand, waves, are put in, I can start the tree area. 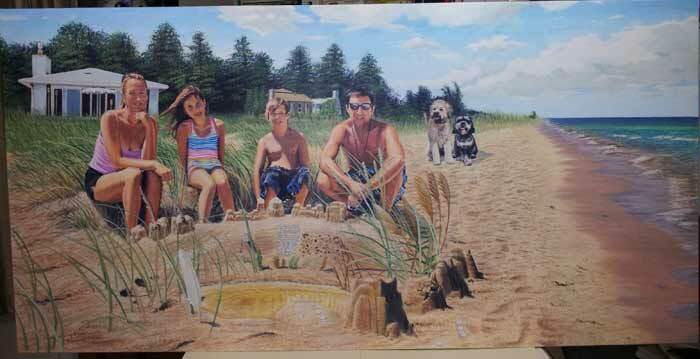 This all leads up, to the sea grass behind the people and the two dogs. 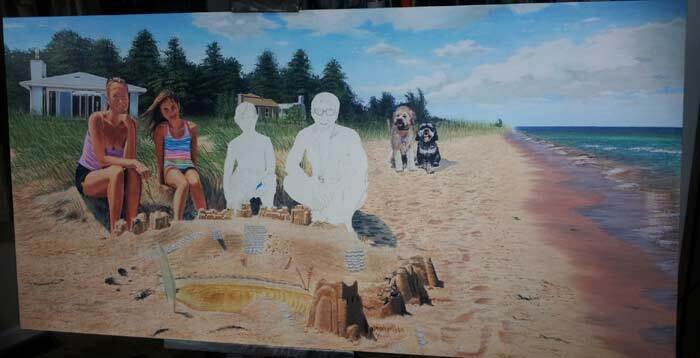 You can see that once the grass is done, I can paint the people & the dogs in front of it. 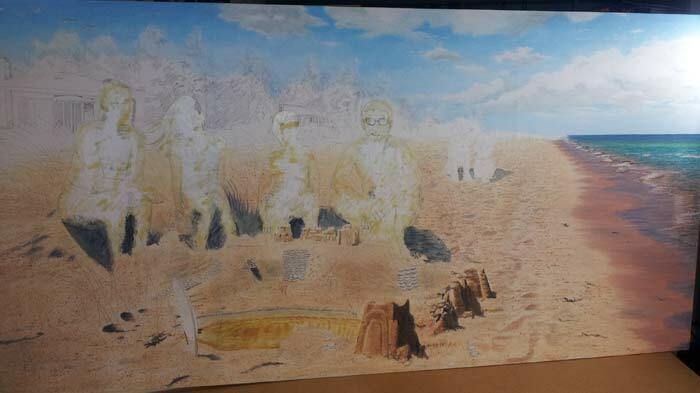 I keep working the painting, moving towards the foreground or front of the painting. Here, the first two people, the mother and daughter are finished. The Father and son are completed. Here is the finished image. You may also see the sand is more dense. 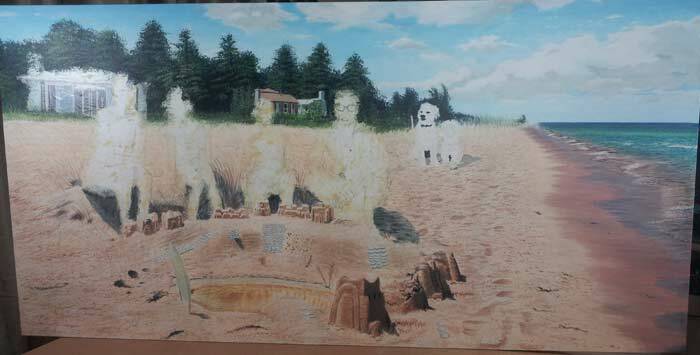 I have the foreground grass painted in, and brighter whites to give a polished look. After the customer approval is given, a clear matte fluid is applied to seal the painting.